V-Essence, offered in liquid form, is a faster absorption formula for that additional vitality boost. The main ingredient in Eu Yan Sang Pure Cordyceps™ is Hirsutella Sinensis, which is a strain of cordyceps that is proven to be 99.645% genetically identical to rare Wild Cordyceps according to rDNA sequence analysis (ITS 1, ITS 2 and 5.85rDNA). 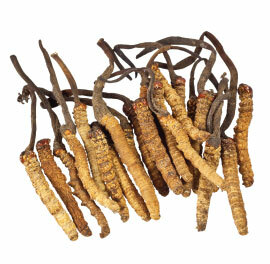 Pure Cordyceps™ V-Essence contains 3500mg of 100% Hirsutella Sinensis per bottle. With such a close genetic similarity, Eu Yan Sang Pure Cordyceps™ also contains natural bioactive compounds of high potency found in Wild Cordyceps, to help improve vitality and general health. ATP is a high energy content molecule1 that is present in every single body cell. They can be thought of as the ‘batteries’ which store energy to carry out just about anything and everything essential for the human body to function. From carrying out something as simple as batting an eyelid, to other complicated things like cell growth and metabolism, our body depends on ATP to carry out such tasks. Notice how everything slows down with age? Our energy levels are no exception. We move slower, think slower and even speak slower. This is attributed to insufficient ATP which is a key factor in ageing2 – Either we do not make ATP as efficiently as before, or more ATP is used to carry out simple tasks that we could previously do with less effort. Just imagine your body’s battery life slowly but steadily becoming flat! When ATP is low, energy levels drop and fatigue sets in. We feel sluggish when carrying out simple everyday tasks. Immunity is lowered and we may fall ill more easily. Containing a super enzyme that is especially effective towards recharging our ATP ‘batteries’, studies have shown that oral administration - demonstrated a significant impact in raising ATP levels in various important organ tissues, such as the heart3 and liver4. And because the ATP changes energy patterns at a cellular level, unlike the unpleasant sugar and caffeine crash you experience after the effects of coffee or energy drinks wear away, the effects are longer-lasting, which means you can enjoy a constant sustained state of vitality. 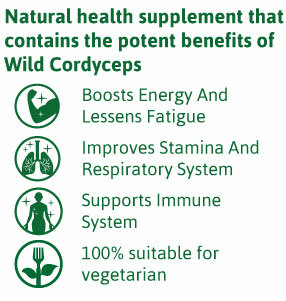 How does Eu Yan Sang Pure Cordyceps™ benefit people in their overall well-being? • People who wish to boost their immunity, improve vitality and lessen fatigue. • Individuals with a very weak body constitution, chronic fatigue, after major operation, recovery from a serious illness. The main ingredient in Eu Yan Sang Pure Cordyceps™ is Hirsutella Sinensis which is a strain of cordyceps that is proven to be 99.645% genetically identical to Wild Cordyceps according to rDNA sequence analysis (ITS 1, ITS 2 and 5.85rDNA). 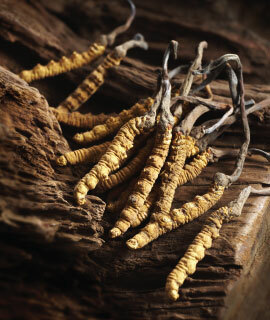 There are over 400 species of Cordyceps worldwide, only Hirsutella Sinensis has been identified as the true strain of Wild Cordyceps – confirmed by scientist in 2001 and further recognized by the Pharmacopoeia of the People’s Republic of China. With a genetic similarity of more than 99.645% to Wild Cordyceps, Eu Yan Sang Pure Cordyceps™ is harvested in an optimum natural environment for cordyceps cultivation using the most advanced biotechnological processes of purification. This ensures purity, consistency and retention of high bioactive compounds of the product. *Can be taken on an empty stomach. Shake well before opening. Upon opening, properly seal, refrigerate and consume within 48 hours. Isolation and then cultivation of Hirsutella Sinensis has proved to be extremely challenging as it only grows in cold environments and at a relatively slow pace. 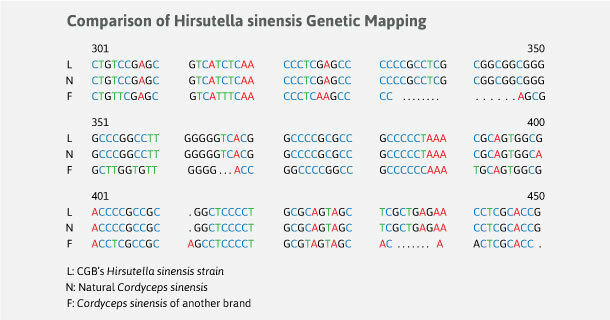 In most instances, cultivation of Hirsutella Sinesis is unsuccessful as minor deviations in the protocols used for isolation and cultivation may lead to bacteria contamination or the culture of other fungal species which are in fact not Hirsutella Sinesis. Pure Cordyceps™ is fermented by strictly replicating a unique set of growth conditions that are geographically authentic to the natural habitat of Wild Cordyceps. These conditions of temperature, water quality, oxygen levels, ventilation, humidity and nutrients are tightly monitored to ensure the optimal environment for the cultivation of the Hirsutella Sinesis in Pure Cordyceps™. By doing so, Pure Cordyceps™ has managed to obtain pure Hirsutella Sinesis, which is 99.645% genetically identical to that of Wild Cordyceps. This fact has been established by rDNA sequence analysis (ITS 1, ITS 2 and 5.85rDNA), which compares Pure Cordyceps™ to the DNA sequence stored in the global gene database. Hirsutella Sinensis contains a cocktail of bioactive compounds (mannitol; nucleosides; polysaccharides; dipeptides; trace elements and super enzyme), substances which are capable of creating positive biological activity in your body. Pure Cordyceps™ uses energised, small-molecule clustered water which gently extracts yet at the same time preserving all the important components that matter. 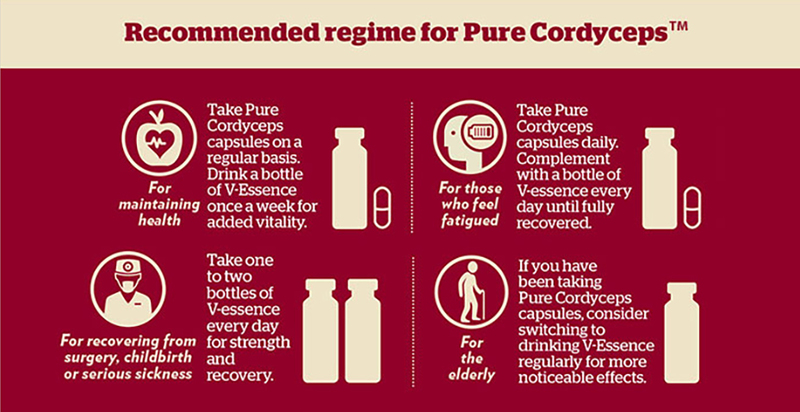 Pure Cordyceps™ V-Essence contains 3500mg of 100% Hirsutella Sinensis per bottle for that additional vitality boost.